The Tawny Owl is the most common of all the UK native Owls. These are the owls that make the “Too Whit Too Woo” noise that we all associate with owls. The noise is made by two owls communicating with each other. The woodland is their main territory but they also like farmland and have even been found in city parks. A diet of mice, rats and other small mammals is most common but they will also eat birds and insects. The owls start to breed in mid march and go on until mid June. They lay their eggs in holes in old trees but these are getting fewer as they are cut down for safety and so they are now using nesting boxes more and more. A clutch of 2 to 4 eggs is normal and these will hatch in 30 to 33 days, the eggs are nearly round, white and about 2cms diameter. The young leave the nest when only 20 to 24 days old and are still fluffy but they stay nearby and the parents continue to feed them until they are fully fledged at about 2 to 3 months old. 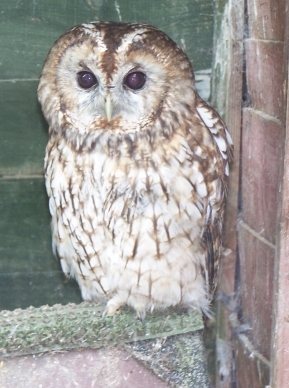 Many people presume that the fluffy Tawny baby has fallen out of the nest and they rescue them and take them to centres. Often these do not need rescuing. The best thing to do is if on the floor place in a tree nearby and keep an eye on the baby to see if a parent is feeding, if no parent comes then contact a rescue for advice.